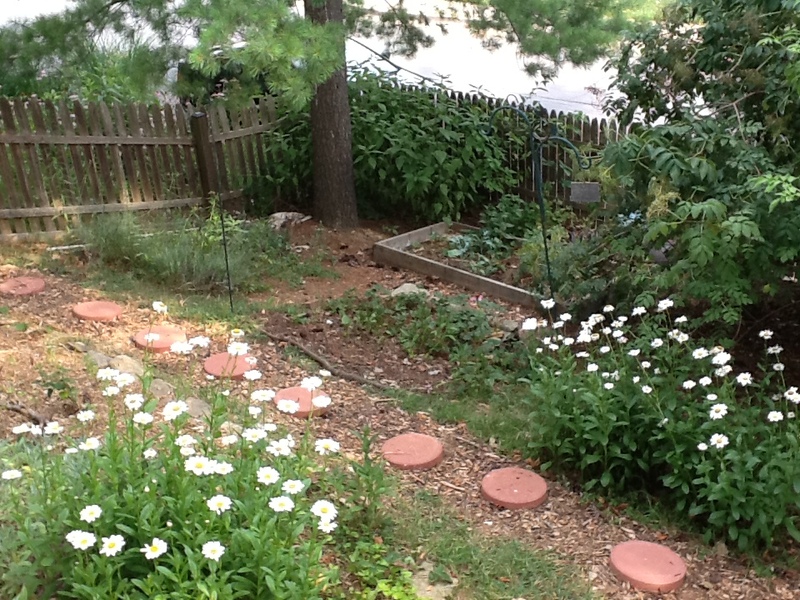 But what has been going well, or at least better, have been my perennial herbs. I have them dotted around my landscape, not in a particular “herb garden” or anything, but spread around in different places. And these, I use. They either come back year after year or re-seed themselves on their own, and I’m able to do a lot with them. What I didn’t realize when I started growing all these herbs is how pretty they are. 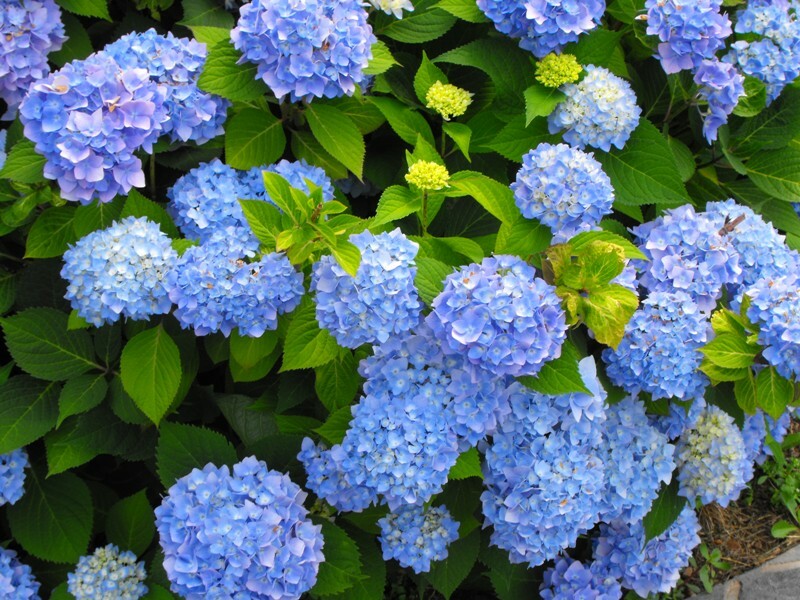 Most produce these beautiful flowers, with varied sizes and colors, and give off wafts of fragrance whenever you brush by them. They are becoming my landscape, and I just want to grow more and more. Basil: Sort of a no-brainer, really. And it’s not a perennial, of course. But every year I either buy a few plants or, if I remember early enough, grow it from seed. The trick is to cut it back every time it’s about to flower, so it puts it energy into making more leaves rather than flowers. If I don’t have time to make it into pesto, I’ll chop it to a paste with a little olive oil in a food processor and freeze it in small cubes to use all winter. Dill: The best partner for an exploding cucumber patch. If my cucumber patch were exploding, which it isn’t. But the nice thing about dill is that it freezes well, and if you leave enough on the plant to form flowers and seeds, it happily reseeds itself and grows more plants the next year. Sage: A great and un-killable perennial herb. Sage gives me fits, because the time I’m most likely to use it is Thanksgiving, when it’s pretty much dead. But it freezes like dill, so I usually try to go out there in September and cut some sprigs. I honestly don’t cook with sage much, but the flowers are gorgeous in the spring…anyone have any great recipes you use sage in? Thyme: This is another great perennial herb to cut and save for cold and flu season; it is one of the best anti-viral and anti-bacterial herbs around. (You know that icky smell that traditional Listerine has? It’s thymol, a constituent of thyme.) Some people make tea with it, which I personally find Really Gross, but you can as easily cook a very thyme-y pasta sauce or soup, where it fits better. Thyme also freezes well—and after its frozen, it’s much easier to get off the stems than it is when fresh. I love growing it—there are so many varieties, including some that act like ground covers. Oregano: Everything I said about thyme? Repeat for oregano. Anti-bacterial and anti-viral, great for cooking, great for freezing, icky tea. 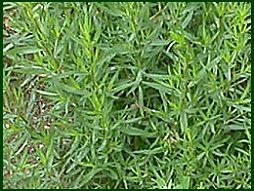 Tarragon: Tarragon makes a great herb vinegar (steep a few sprigs in wine or cider vinegar for a week or two), and is delicious on salads or in a vinaigrette. It’s also really good either dried or fresh in cooking, especially with chicken or mushrooms. The cool thing with tarragon is that it is like two totally different herbs when it is fresh vs. when it is dried. Fresh it has a light citrusy anise-type flavor; dried it’s a little earthier, and the licorice essence is gone. 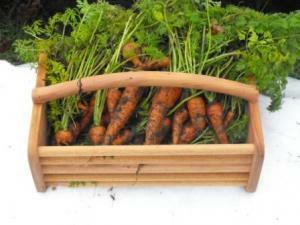 Unlike most herbs, it can’t be grown from seed, only propagated from other plants. 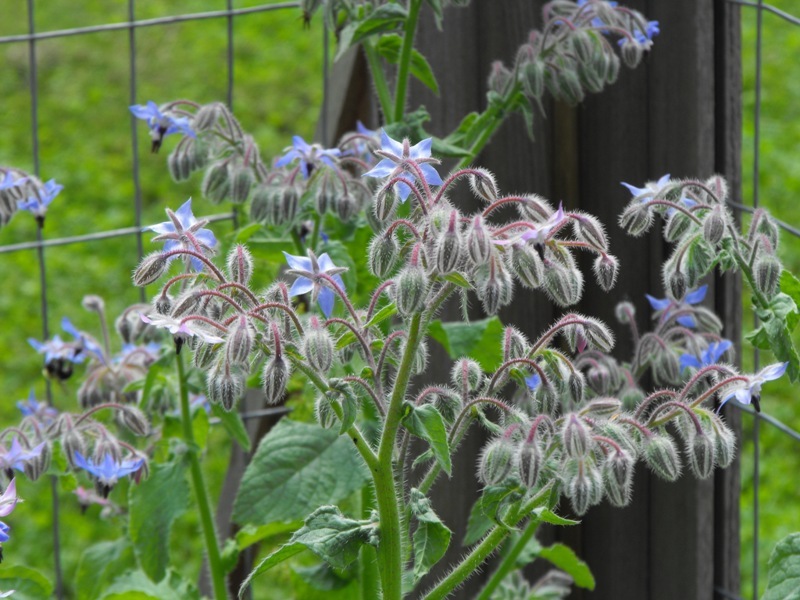 Fortunately, it’s also a pretty hardy perennial. Lemon Balm: a mint relative, this one will take over your garden and never ever die. It makes a delicious iced tea, especially mixed with mint, and is said to have calming sedative effects. I make a tincture of it too, where I soak a jar-full of lemon balm leaves in 100-proof alcohol for 6 weeks and then drain it; this, combined with some lavender tincture, is my anti-insomnia potion. Anise Hyssop: This is a new one for me. It makes pretty purple flowers, has a delicate licorice-like scent, and is just…nice. It hasn’t really established itself yet, but it’s working on it. I haven’t harvested any, but I’m told it makes really good tea and is nice with fruits and in cookies and stuff. Mostly it’s just…nice! It’s pretty and fragrant and just lovely. 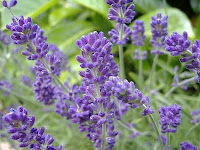 Lavender: This is my best friend in the herb garden. Sweet-smelling, delicate, silvery-foliaged…I probably have a dozen plants now. I have some tincture brewing on the counter, and nothing is lovely before bedtime than a cup of warm milk with a couple sprigs of lavender flowers and a little honey. In baking, in oils, in baths, pretty much anywhere, this is my favorite herb of all. Chamomile: There are two different kinds of chamomile, English and Roman. 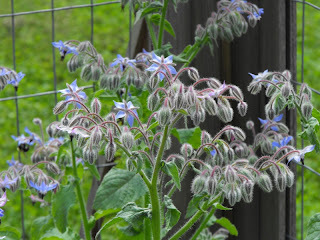 Both have thin feathery leaves and tiny daisy-like flowers. English is an annual, Roman is perennial. English is usually what you make the tea out of, and it re-seeds itself beautifully and comes back year after year as long as you don’t care that it stay where it was, and brews into a very fragrant tea. Roman chamomile has a slightly bitter taste when brewed, but its flowers are still beautifully fragrant. I grow both. So…that’s a tour of my herb garden. What do you guys grow? Any favorites I’ve missed here? Although I have failed miserably at growing an uber urban garden, I believe that lawns are such a colossal waste of space and water. When we lived in the Okanagan Valley (British Colombia interior), I was shocked at the BROWNNESS of the non-human regulated nature-spaces. It is, however, a semi-arid desert (complete with tumbleweeds) so it was supposed to be brown. Everything except the suburban lawns. Green green green sucking up LOADS of water during the minimal rain summers. And for what? It's not like anyone really USED them for anything (at least in Vernon). Hanging out on your front lawn just is kinda creepy. That's why urban front kitchen gardens are so amazing. Why not use that space (especially if you live in a low-traffic suburban neighbourhood- less car fumes) to grow food? 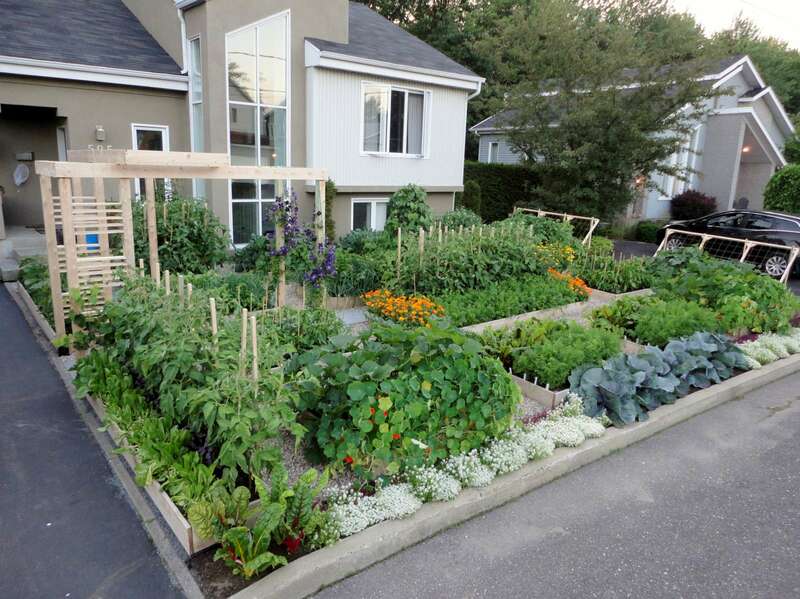 Recently a Quebecois couple's small kitchen garden (called a "potager"- /poh-tah-zj-ay/- in French) have received quite a bit of international and national media attention. 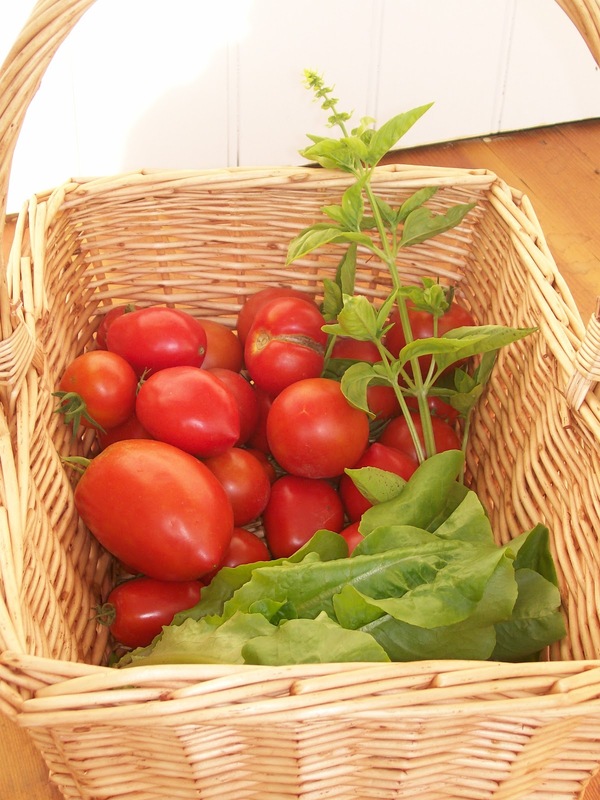 They have created an absolutely beautiful front kitchen garden complete with a gorgeous trellis this summer to try to supplement a healthy, more vegetable filled, diet. Josée Landry and Michel Beauchamps even received permission from the city to grow 'something other than lawn and flowers'. Except they didn't specify a garden. And now the city is kinda pissed. Josée and Michel's backyard is shaded, so they thought- why not take advantage of all the beautiful sun in their front yard? 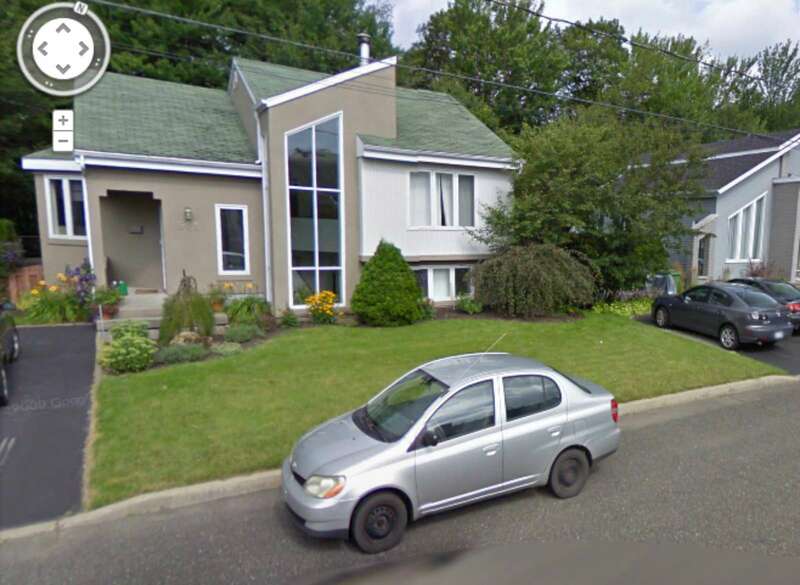 They spent thousands of dollars to create a gorgeous garden (that seems to be doing very well) only to be informed by city officials that they are in violation of city by-law and must revert their garden to at least 30% 'regular' front lawn. Seriously?? 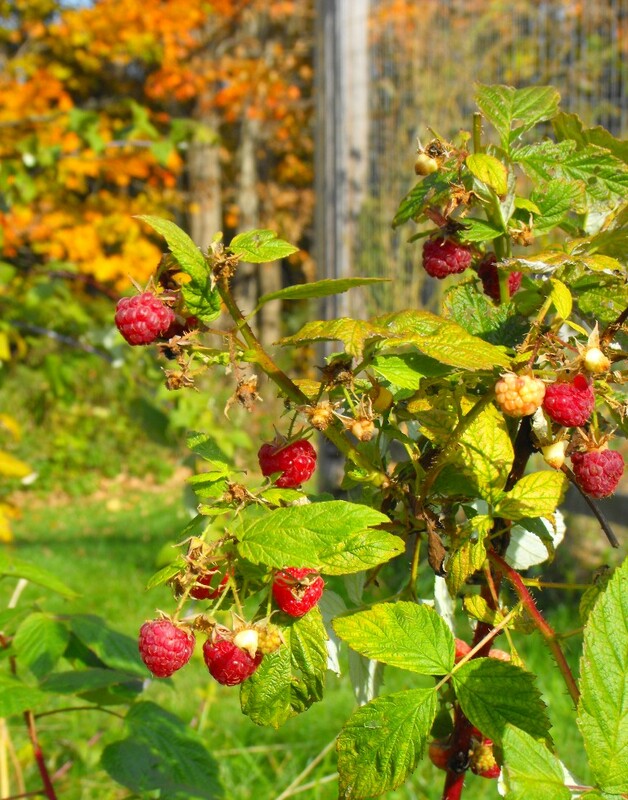 Interestingly, this story was picked up by an American, Roger Doiron-whom I heard interviewed on the French CBC and speaks excellent French- AND convinced Michelle Obama to have a kitchen garden in her yard. He has created a petition (bilingual!) asking the Drummondville City officials to allow this couple to keep their front yard garden AND a French letter to be sent to city officials. Due to the International and National interest, the city has granted Josée and Michel until September 1st to revert their kitchen garden and supposedly the topic will be on the agenda at the August 13th council meeting. Although a reprieve and a good step, this beautiful initiative should not be punished, but encouraged. In order to rethink and move forward with how we live and obtain our food, encouraging people to be more self-sustaining and growing kitchen gardens should become the cultural norm. Take a minute, sign the petition, send the letter (even if you can't read it- I assure you it says exactly what you want it to :) ), and find out what your local city, town, municipality's by-laws are for front yard gardens. As the resident Pug and star of Mama's blog, I thought I would take it upon myself to help out Mama. The small humans are sick a strange plague and she seems a little tired. This is our favorite eco-friendly video and a great reminder of how easy it is to be green. After all, if a Pug can do it... any one can! Wanna know more about me? Check out Pug in the Kitchen tomorrow for a bio and photos of my cuteness! To say this gardening season has been a disappointment has been the understatement of the year. The Midwest drought has meant that we've had terrible misses in the garden. Our six tomato plants have produced three fruits - two of which rotted before they reddened. I've seen one jalapeno. Many squash flowers but no actual zucchini. And I would love, love, love a fresh cantaloupe...but there are none to be found at our local markets. I realize it could be worse. My livelihood does not depend on my sad garden that's produced little more than three-feet tall dill plants and a score of weeds. But summer's only half over...and the gardening seasons have just begun. Gardening is one part science, one part luck, one part patience. And just like we tell our kids, just because it doesn't work the first time doesn't mean we won't do better next time. 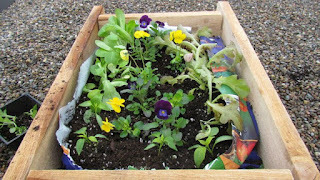 Today the Climate Crusader is sharing some of the lessons her children have picked up in the garden. In spite of the fact that my success as a gardener is hit-and-miss, I do persist in growing my own veggies year after year. One of the biggest reasons is my children, seven-year-old Hannah and three-year-old Jacob. It's really important to me that they know where their food comes from. I want them to understand why we call carrots "root vegetables" and how much better a freshly-picked tomato tastes. I've also found that they're far more willing to try new vegetables when we grow them ourselves than when they show up, already cooked, on our dinner table. Over the years I've been gardening with my kids, I've watched them learn some extremely valuable lessons. Today, I'm sharing the top five with you. 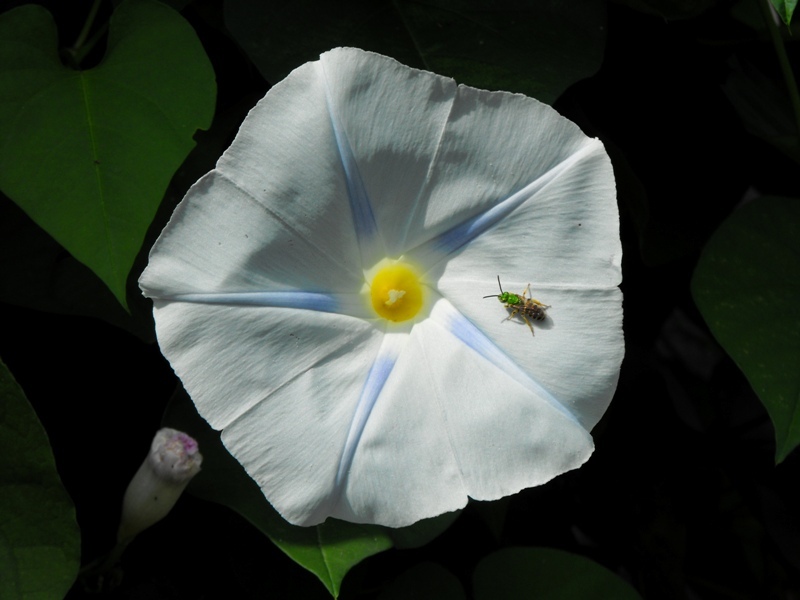 Interdependence - In order for the plants in our garden to grow, we depend on a lot of other creatures. 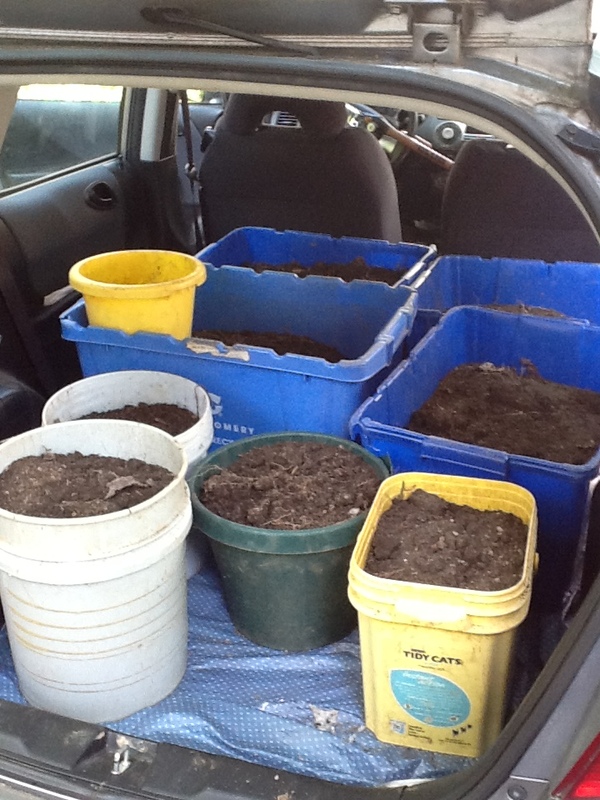 Worms help to create compost, and they aerate the soil. 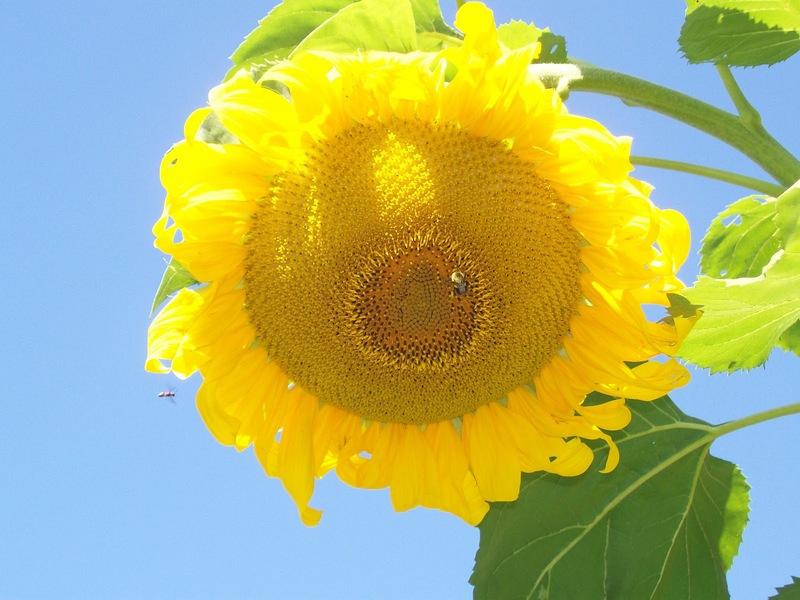 Bees pollinate the flowers that our berries and tomatoes grow from. Ladybugs eat other bugs that would harm our plants. Human beings are just one part of an interdependent web of life. Responsibility - If we want our plants to survive, we need to plant them in the right place at the right time. 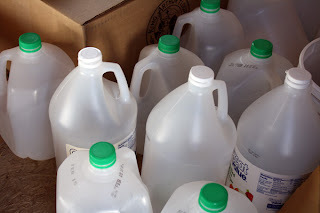 If we get a hot, dry spell, we need to water our plants. 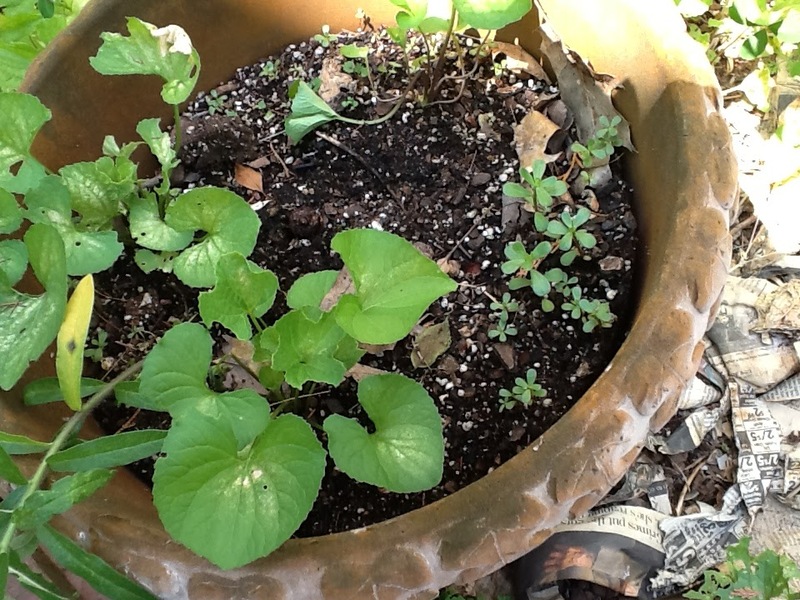 If weeds threaten to choke our little seedlings, we need to pick them. 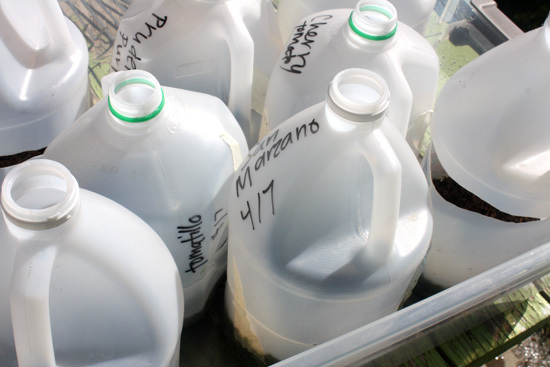 These little lessons in taking responsibility fill your daily life when you're growing a garden. Environmentalism - If we want the Earth to provide us with food, we need to take care of it. We can't throw garbage on our gardens, or trample our plants. We need to consider the impact of our actions and tread lightly if we want to enjoy the harvest. Love of the Outdoors - By its very nature, our garden is outside. Any time we spend in the garden is spent outdoors. We get to experience the weather, and see the birds, butterflies and neighbourhood cats that wander by. And we get a first-hand view of nature at work. This helps to create an appreciation for the outdoors. Appreciation for Food - Food tastes better when it's freshly-picked, before it has time to lose any of its flavour. But it's even sweeter when you grew it yourself, and you've seen the time and effort involved. Because my children have been out in the garden picking their own peas, carrots and blueberries since they were babies, they've learned an appreciation for fruits and veggies. Do you garden with your children? What lessons have you seen them pick up while they were growing vegetables? I have always wanted to have a garden. Growing my own vegetables? It's like the EPITOME of being green. I am not only controlling the chemical burden of my food from the soil and compost to the seeds purchased, but it is local and self-sufficient to the extreme. Unfortunately we live in an apartment, which makes gardening a little trickier. However, initially I did not think this would be impossible. Until last summer. Our first apartment had a balcony. I was determined to grow easy vegetables and berries in containers. We bought compostable containers, organic local soil, organic earth worm castings (poo) for fertilizer and organic seeds from a PEI company. We started them inside, I ouu'd and ahh'd over our little seedlings and almost peed my pants every single time I could pick one miniature carrot, lettuce leaves or tiny strawberry. Mid-way through the summer it was obvious that my garden was cursed. We had wasps take up nesting in the peas, the carrots decided they were going to stay smurf sized and the lettuce became the home to hundreds of weird little transparent bugs. The following summer we moved to our current apartment. That doesn't have a balcony. It was a concession because I loved the place so much. It does have a tiny green space in front of the living room window, but it leads directly to the parking lot. I don't especially want to eat food that has had layers of car exhaust. So that option was out. Last summer we decided we would have a rooftop garden. Our fire escape leads directly to a flat roof, so we bought a locally milled from forest stewardship certified wood planter box. We bought some pretty flowers and peppers. I was pumped- the perfect location! 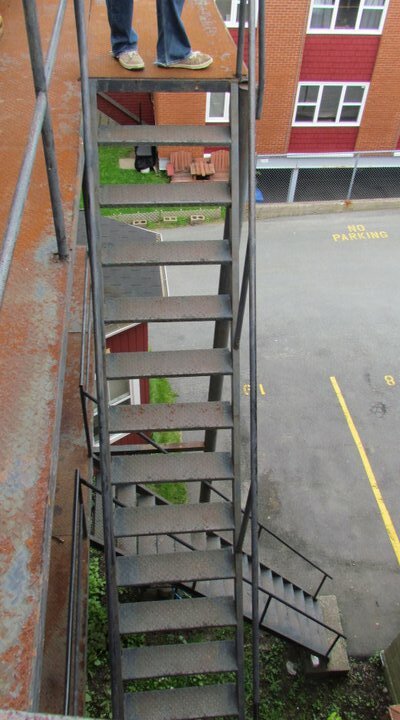 Except it quickly became obvious that walking up and down the fire escape past our neighbours bedrooms would be awkward. The girl who used to live on the top floor walked around her apartment naked. And she hadn't bought curtains yet. 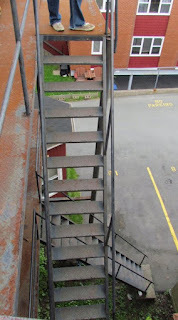 Also, technically we weren't really ALLOWED up on the roof and our landlord's husband liked to sit out and pretend to be the parking lot police. AND who knew that carrying a watering can up three flights of precariously thin and rickety stairs when you're afraid of heights isn't fun? The result? They all died and in October Andrew had to bring the whole thing down- I was too much of a chicken to do it. 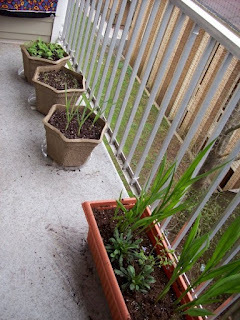 I then decided perhaps we could at least grow herbs in our apartment. Unfortunately, as you can see from this picture- although we have huge windows our apartment is kinda like a cave when it comes to light. We barely get any. Atreyu and Asteya, our hungry cats, love snacking on leaves- so most of our plants are barely holding on. Since the waitlist for city urban gardening plots are months (to a year) long, that was also out of the question. So. I have had to accept that my amazing gardening skills will have to wait until we have our own house with a small cute plot. Then I will be an amazing uber gardener. there was hail involved at one point. I just remember that I loved them as a kid! 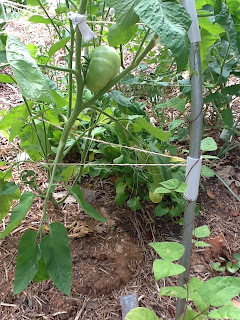 There are tomatoes in the jungle of leaves! I'm blown away by the number of peppers on the regular pepper plants! The lone Tom Thumb lettuce, surviving amid the peppers and stunted cauliflower. Last year, we didn't get a garden in. 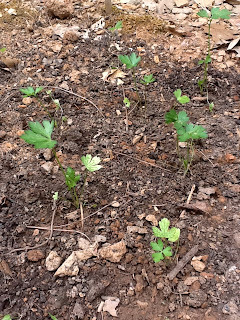 I really, really wanted to, but since we had moved to a new home and I had a baby in the middle April, not even parsley got planted. This year, we were in the middle of putting in a fence, so... it took longer than I had planned to get the garden in. My garden has only been planted and tended for 6 weeks, but already the weather has been cruel to it's existence. The heat slaughtered all my cucumbers despite my best efforts to kept them shaded and watered. I lost 7 tomato plants, 95% of my lettuce, ALL of my kale (but that was the fault of a certain 2 year old), ALL of my herbs and one Inferno pepper plant. I'm planning to replant the lettuce and kale by the end of the month so that I can have plenty of fresh salads through the Fall. 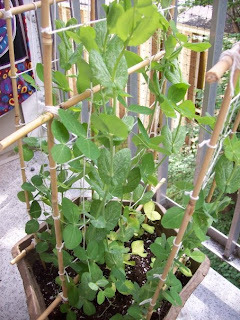 Once my beans are done, I plan to put in sweet peas. How does your garden grow this year? Any harvesting yet or are you waiting like me? With much of the country in a heat wave who wants to cook/bake snack foods? Cool snacks are also a good way to beat the heat. Here are some easy, cool and no-bake snacks to make this summer. Smoothies: Smoothies are not only an easy snack but they are also a good way to eat more fruits and veggies. Simply add 60% fruit and 40% veggies (spinach works really well), some water, and blend. You can also add some plain yogurt (skip the sweetened kinds), hemp powder, coconut milk, and all kinds of things to add more nutritional value to your smoothies. This is also a great way to use up produce that is about to go bad. Popsicles: The options for what you can make into a popsicle are endless. You can freeze juice, smoothies, ice cream, and I've even made popsicles out of iced coffee. For your dogs you can make yogurt and peanut butter popsicles to help them cool off (be sure to use unsweetened yogurt and real peanut butter with out the added sugar and oils). It's best to use stainless popsicle molds like the ones above from Onyx, to avoid any nasty chemicals that may be in the plastic ones. Ice Cream: Ice cream is a nice treat for a hot day. When you make your own ice cream you can control the ingredients to make a healthier treat. A very eco-friendly way to make ice cream is with an ice cream ball from Play & Freeze, like the one above. These ice cream balls are BPA-free and use no electricity. You simply roll the ball around until the ice cream is done, it can be a fun way to get the kids involved. Fresh fruit: A lot of great fruit is in season right now and it makes for some great snacks. Fruits that can be pre-washed like grapes are great for snacking. You can also cut up things like watermelon or pineapple so that you have a quick snack you can grab out of the fridge. You can even freeze grapes on a cookie sheet, covered in waxed paper for an even cooler fruit snack. These are just a few easy, cool, and yummy summer snacks. I would love to hear your favorite summer snacks for staying cool, be sure to share them below. It seems like just yesterday that I was planning changes to our garden, and putting up low tunnels on the coldest day of the year. Those are distant memories on humid 100-degree days. I don't complain, because those nippy days are not my favorites, and I love seeing those berms and beds with lots of lovelies growing in them. Come along on my little walk! It pained me to not fill the containers to the top. Doing so would have made the load heavier than I felt comfortable hauling. The purslane is popping out. That will be a salad ingredient. 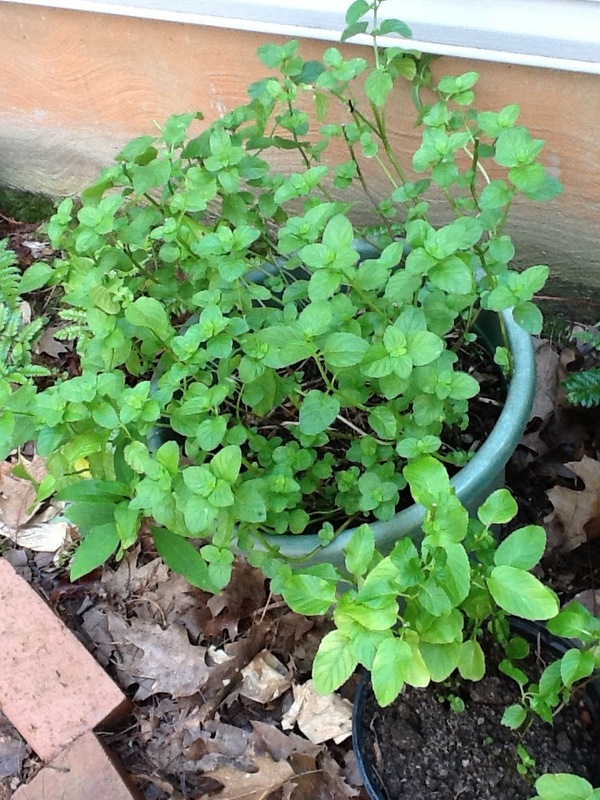 A local Freecycle Network member shared this divine Lavender Mint. It's doing beautifully, and smells very nice. Unfortunately for a neighboring family, the derecho which roared through here on June 29 took down half of one of their trees. The next morning, it was fantastic to see (and to be one) of the other neighbors who pitched in to cut it into pieces and remove it. I saw opportunity in the storm debris: a trial-sized hugelkultur bed. 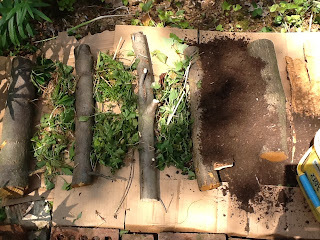 I carried some of the branches home, laid them out, added in some miscellaneous greenery destined for the compost pile, added some of that composted horse manure, and stuck in some scallions. The passionflower vine is producing flowers. (There's one on the right, about 1/3 from the top.) They are a sight to behold! I look forward to sampling the fruits. The rabbit hutch is another Freecycle Network find. 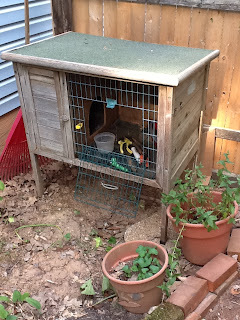 It turns out that our rabbit (yes, we've added one to our family) lives indoors, but the hutch has turned out to be a very handy "tool shed". One of the TruffulaBoyz' tasks in the morning is to water some of the more vulnerable plants. 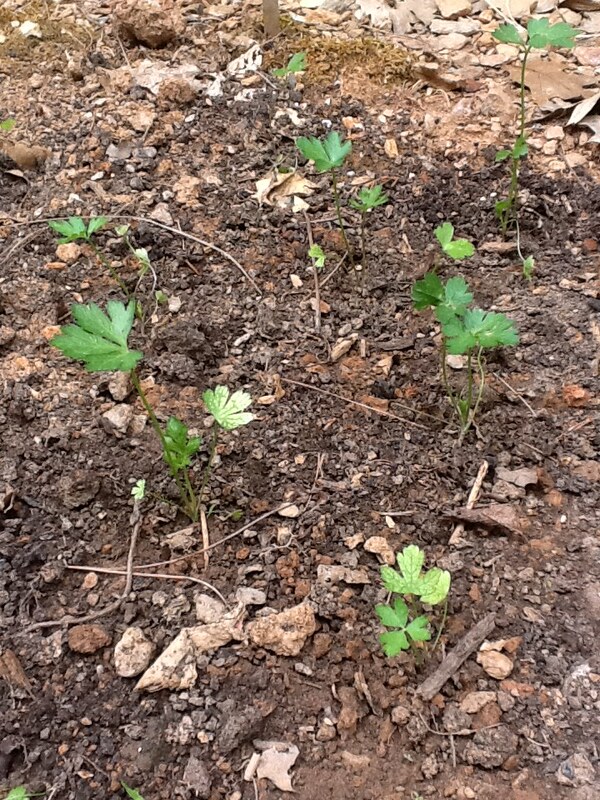 These little parslies are settling in next to the "P" in our Alphabet Garden. Note the application of... horse manure! Not all is green in Truffula-Land. 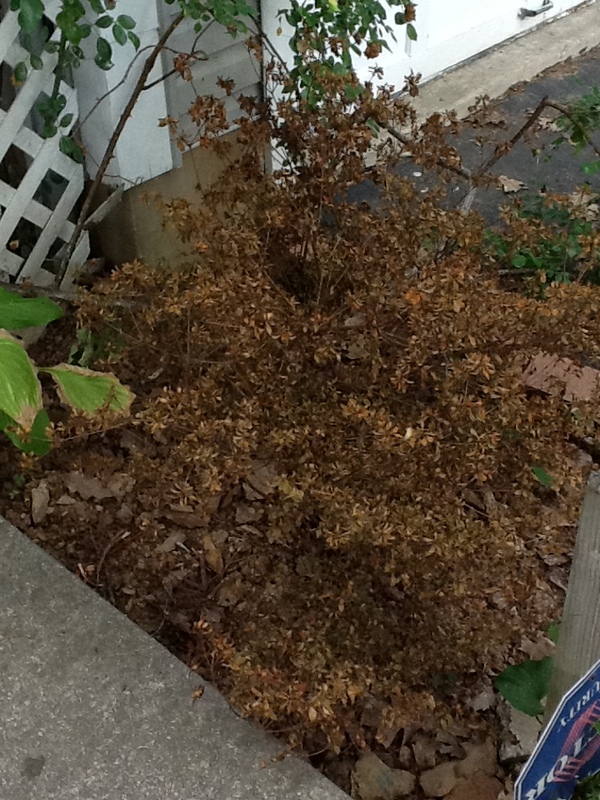 I transplanted this azalea in the spring, and apparently didn't give it the water it needed. 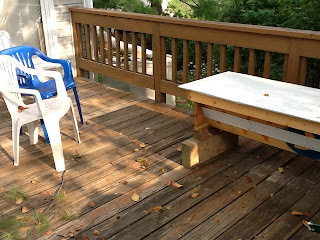 I'm happy to take suggestions for a drier-than-we-think, shady location, right smack-dab in front of the house. 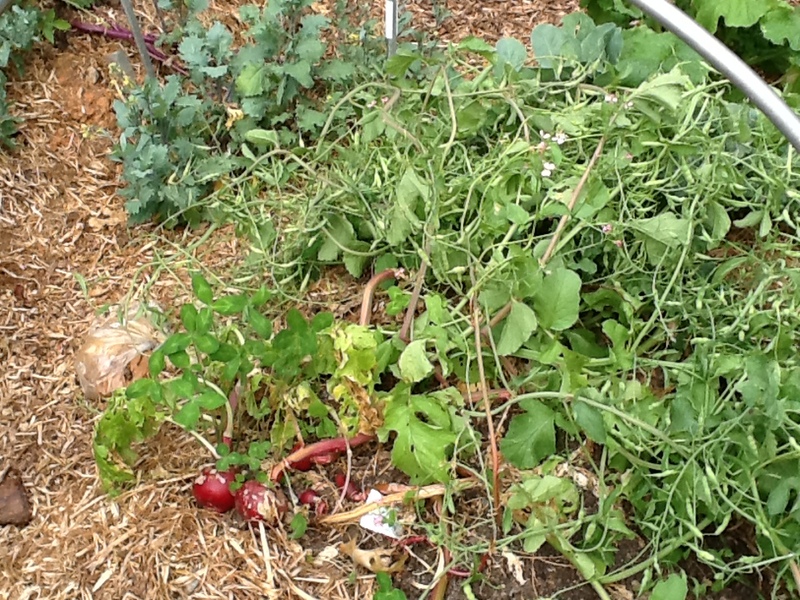 The baseball-sized radishes went to flower, and now to seed -- another oops. I was going to yank them, until I noticed a honey bee shopping around in the flowers. That was a deal-clencher: the radishes stayed in. We'll harvest the seed, and try again. The hoops from the low tunnels are continuing to serve. 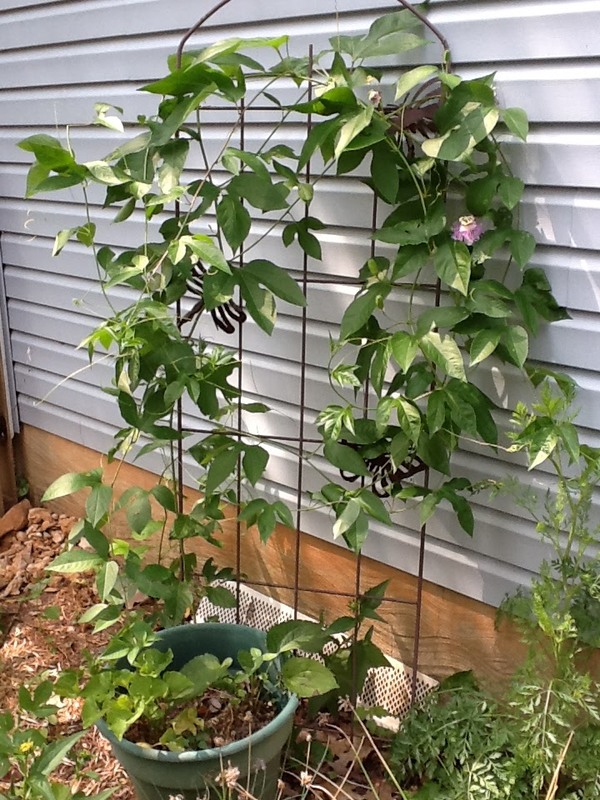 I'm using them to stake up the tomatoes, and to train up some beans (lower right in the photo). The clips which previously held the floating row cover and plastic sheeting in place are now holding up twine. I'm using strips of old socks to tie in the tomatoes. Here's an all-in-one shot. Since Gardening is our theme for July, I'm going back and reliving some of my gardening triumphs. Of course, the failures are fun to look at, too, but for now I'm thinking about victories in my Victory Garden. What are some of your biggest gardening successes? Please share in the comments, and join the linky if you have posted a Wordless Wednesday this week! Oh, and Happy Independence Day!!! We're changing up the schedule here at The Green Phone Booth, so you may see some growing pains while we all adjust to the new routine. Late with her post but undeterred, today the Climate Crusader kicks off gardening month. A little more than a year and a half ago I found myself standing in a field, talking to a young farmer. 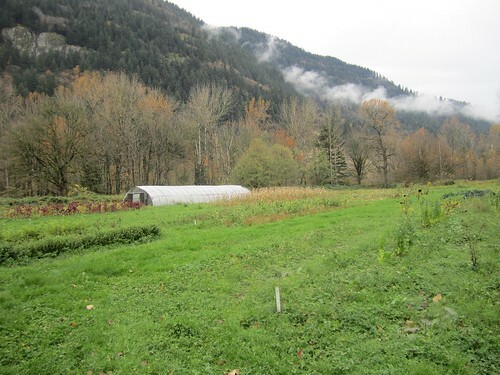 Amy Seuss is one of the people behind Skeeter Farm, a small vegetable farm based in the Fraser Valley outside of Vancouver. 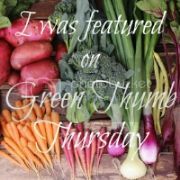 As we talked about her experiences farming and my experiences gardening, the conversation turned to my mixed results when it comes to growing food. She told me that she believes some people just instinctively understand plants, and others ... don't. When I relayed this conversation to my mother-in-law, who is a gardening superstar, she agreed. Sadly for me, unlike Amy and my mother-in-law, I am one of those people who wasn't born with an instinctive understanding of all things plant-related. I do try, though. I have a decent-sized vegetable garden in my back yard. I subscribe to seed catalogues and dutifully read all the information I can find about how to grow the seeds I buy. I try to do everything right. Sometimes, it all works out. Other times, in spite of my best efforts, my little seedlings all die. I may try to grow 12 or 14 different kinds of veggies each year, but I generally only harvest half that amount. 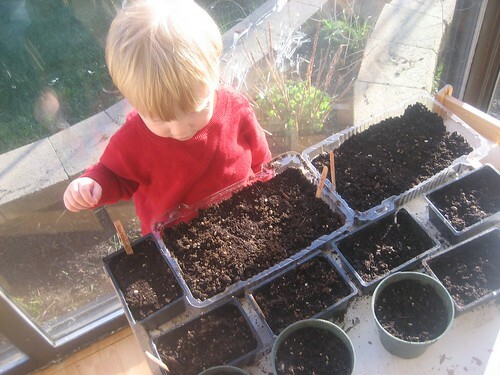 I want my children to understand where food comes from, and there's no better way to do that than growing it ourselves. In crunching the numbers, I'm convinced that it's still way cheaper to eat veggies from my garden than to buy them, even if I don't have 100% success. I hope that, through my trial and error, I will eventually get better. To expand on that last point, there are a few crops that I have had continued success with. If you, like me, are a hit-and-miss sort of a gardener, let me suggest a few crops to start with. 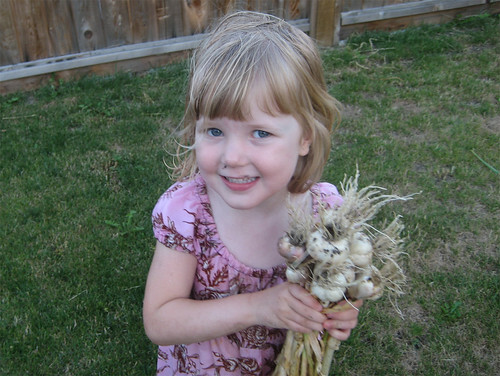 Garlic - My garlic produces for me every year, and it's really easy to grow. In the fall I pick up a few bulbs of organic garlic from my farmers' market. I break them into cloves and plant them. In the early summer I harvest the garlic scapes, and in the late summer I harvest the garlic, which I hang in a dry place and enjoy all year. 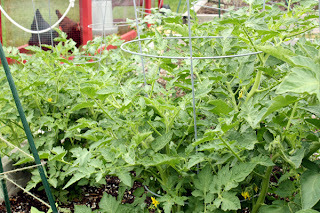 Potatoes - Potatoes are another plant that is easy to grow and keeps well when harvested. I generally order seed potatoes and they arrive in early spring. Then starting in early summer I can harvest new potatoes, and in late summer and early autumn I harvest their bigger siblings. Herbs - Many herbs are perennial, meaning they'll come back year after year (or, at least they do here in the Pacific Northwest). My sage, mint, rosemary, thyme, oregano, chives and lavender have been great producers, with little or no effort on my part. 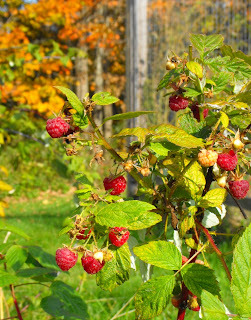 Raspberries - Raspberries grow like weeds. 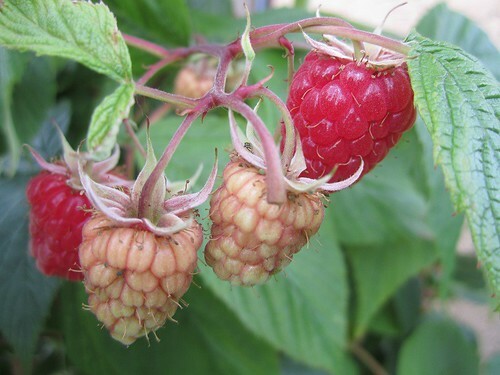 I bought two plants over eight years ago, and they've spawned a whole raspberry patch. Mine are everbearing, so they produce two crops each year - one in early summer on the old growth, and one in autumn on the new growth. They're super-easy, and the kids love them. 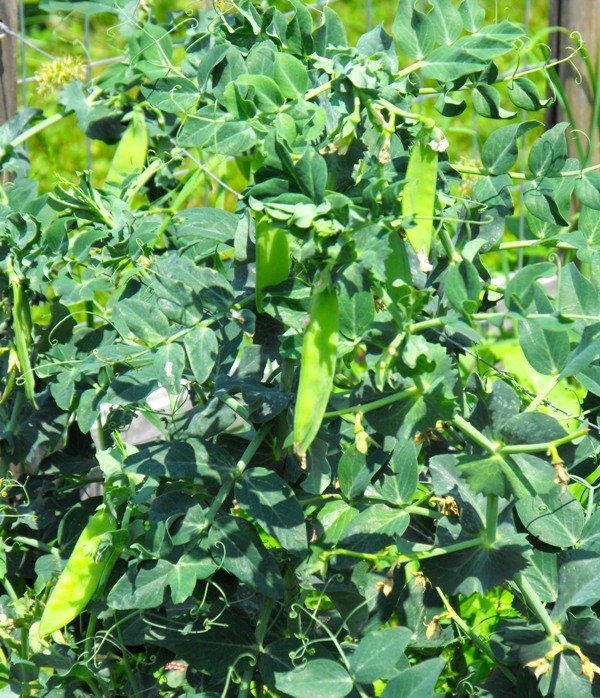 Peas - Peas are another favourite with my kids, and they always come through for me. 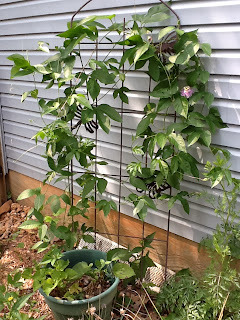 I have a trellis for them to climb, and I plant them in a few batches to prolong the harvest. I don't think any peas have ever actually made it inside our house - they all get picked and eaten in the garden. Are you a hit-and-miss gardener, or a gardening pro? What crops produce well for you, year in and year out?